Choose from in-depth classes in limited sessions, ongoing, à la carte workshops and exciting collaborative events! 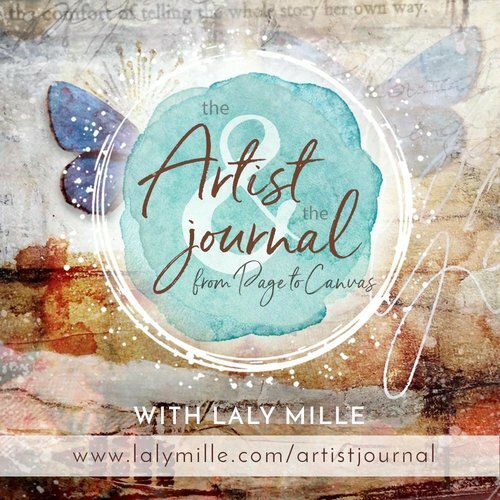 Explore art journaling and mixed media painting, and grow your wings from page to canvas! Indulge your creativity all year long! A whole palette of inspiring projects in mixed media painting, art journaling and dimensional art to nurture your inner artist and spark your creativity... Join now! Create gorgeous floral abstract paintings with this fun mixed media layering process: embrace color, welcome the unexpected and let your heart bloom with joy! Create your own Jane Austen heroine to express the longings of your heart and explore your feelings as a woman in the intimacy of your art journal. A delightful mixed media & art journaling workshop: Follow the whispers of your soul to create a beautifully layered artist book with paper, fiber and so much more! In this whimsical project, we will be working with beautiful, unusual and recycled materials to weave mini artworks that can also be turned into the yummiest journal covers! A luminous journey of self-discovery through mixed media painting: Learn all my favorite techniques and let your light shine through your art! A magical adventure through art journaling and mixed media painting. Deepen your voice, grow your wings and take the leap from page to canvas! I teach in a way that will open up new possibilities to find your own style, while showing and explaining every little detail of the techniques that I use. Whether you are new to mixed media art or a seasoned artist, you will be guided to grow your wings and shine your light in beautiful new ways! This workshop in ebook format is all about being inspired by Mother Nature! With my lesson “The Poetic Botanist” where we combine vintage botanical prints with poetry and image transfers! This year-long mixed media art class is all about celebrating your creative gifts and taking time for YOU every week, so you can show up with more joy in all areas of your life! This year-long mixed media journey offers you video lessons from 26 teachers on a weekly basis + a supportive classroom to make new creative friends and share your discoveries!